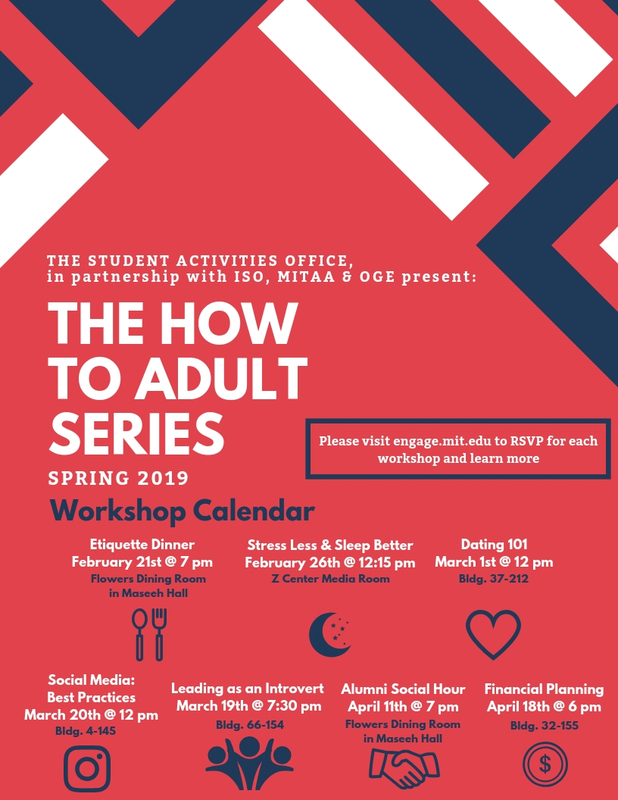 How to Adult is an annual series of events meant to support students in developing skills for life. Events include an etiquette dinner to help students get comfortable sharing a meal with a future employer or boss, a dating workshop that offers strategies for how to ask someone on a date, and an alumni social hour where students can practice networking with recent MIT alumni working in the Greater Boston area, as well as a workshop on using social media to build your personal brand and how to maintain a professional social media presence, and a financial planning workshop geared towards graduating students that will cover important topics like establishing good credit, creating a savings account and paying off your student loans. These events set students up for success outside of the classroom and after graduation and are generously sponsored by MIT’s Alumni Association, Global Education and Career Development, International Students Office, Undergraduate Advising and Academic Programming and Student Activities Office.